Luigi Capozzoli was born in 1876 and died in 1958. He was the son of Joseph Capozzoli, 1841-1921, and Carmella Panuto, 1843-1925. Maddalena Peduto was born in 1876 and died in 1925. She was the daughter of Anthony Peduto and Stella Salerno (dates unknown). As we all know, our roots go back to southern Italy in the province of Campania which is in the region of Salerno. There, on a big hill about 358 feet high, is the Village of Castel San Lorenzo. In that village, our paternal grandmother Maddalena Peduto was born in 1876. 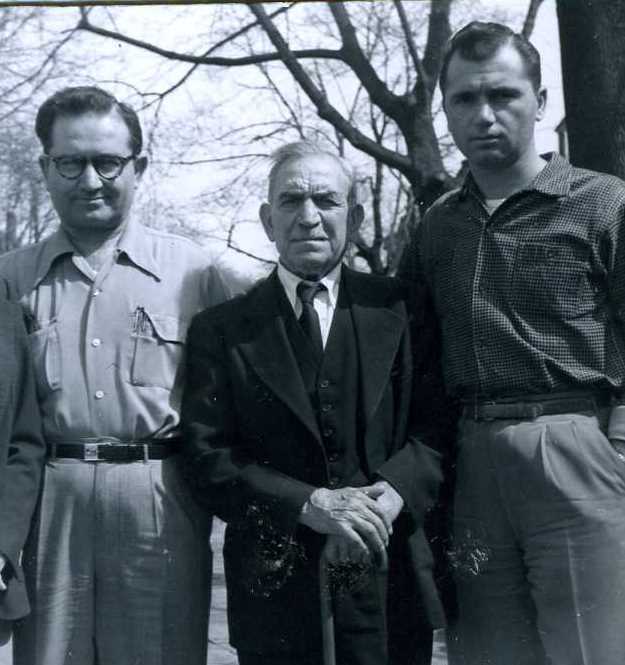 Less than 10 miles away in the village of Aquara, elevation 567 feet, our paternal grandfather Luigi Capozzoli was born in 1876. This geographical area lies less than 75 miles from the beautiful seaside city of Salerno, long the winter resort area of Roman nobles, popes, and aristocracy throughout Italian history. It has been called the garden spot of the world because of its climate and vegetation. It is an area of mountains and hills. The famed Calore River winds its way through the Alburni Mountains and fills the valley between the villages of Castel San Lorenzo and Aquara. Picturesque views can be seen for miles around from the narrow winding roads that circle the terrain and dip into the many fertile valleys. We’ve been told that it is on a farm in that valley that our forebears first met with “Gramp” working as a young horseman, and farmer, on the land owned by Gramp’s family. The feudal system was still in effect that had survived centuries in most areas of Europe. Many of these villages still have Roman artifacts and remains of buildings and walls. Castel San Lorenzo is on a map on the wall of the Vatican Museum put there in the 1500’s when Pope Gregory ordered that all of Italy be mapped. You can be sure that our ancestors were there then and most likely much earlier because travel was practically non-existent because of the terrain and the fear of attack by strangers. And so, it was that Luigi Capozzoli met Maddalena Peduto and were married when they were 18 years old. However, because they were of different stations in life, custom dictated that her parents disown her and she lived with her father’s sister. After Anthony was born in 1894, Gramp went into the Army and served two years as a groom and coachman. In 1898, 1899, and 1902, John, Vincent, and Frederick were born but Gramp, having returned from the service, was already planning to come to America to seek his fortune. His mother’s sister, Rose, lived in Little Italy-Chinatown are of New York City and, early in 1902, he left his family behind and came to New York. He and his life long friend, Pete Lagana, got jobs working on a farm in Broadway, Flushing, in the area where Crocheron Avenue and Northern Blvd. meet. He saved all the money he could and, in the fall of 1902, he arranged passage for his wife and four sons to travel some 125 mile to the port of Naples, and thence to America. The crossing took 8 days, including a stopover in Tangiers for repairs. They arrived in America in May 1903. The Statue of Liberty was a welcomed sight for our family members and the hundreds of others who came to America. They were leaving behind a land of poverty, sickness, unemployment, lack of educational facilities, and a feudal system that is still flourishing today. But, they also left their roots and the traditions of centuries that had sustained them and their ancestors. We, who enjoy the benefits of our lives here in America, should never forget our indebtedness to our forebears, who despite their lack of formal education, were intelligent people, with courage greater than we could imagine. They made many sacrifices and gave us a heritage we can be proud of. Be proud of your family. Luigi and Maddalena’s first four sons were born in Castel San Lorenzo; Anthony in 1894 (died 1954), John in 1898 (died 1995), Vincent in 1899 (died 1972), and Frederick in 1902 (died 1974). Joseph was born in New York in 1904 (died 1999). The “Capozzoli Girls” were all born in New York; Emily in 1905, Christina in 1907 (died 1981), Mary in 1910, Rose in 1911 (died 1991), and Adeline (Dell) in 1913.The family operated a farm in the area of Queens, Long Island, which later became known as Whitestone. Later they moved to another farm in nearby Flushing where Maddalena died in 1925 at the age of 49. Luigi lived to be 82. He passed away in 1958 while living with his son,Vincent, in Spring Valley, California. He is buried beside Maddalena in Flushing, New York. In 1984, records indicate that Maddalena and Luigi had 10 children, 24 grandchildren, 71 great grandchildren, and 26 great-grandchildren. This totaled 131 persons in the 90 year span from 1894 to 1984. In 1984, 24 male members of the family carried the name Capozzoli. It is now 25 years later and time to do another count of descendants! 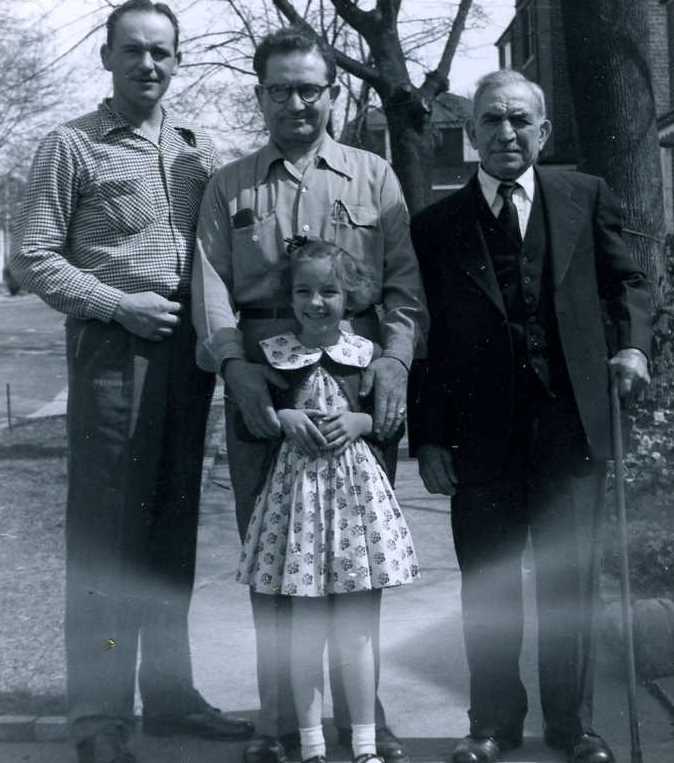 This photo taken in 1954 represents four generations including Luigi Capozzoli, his son, John, grandson, Lou, and great-granddaughter, Barbara. My granparents were form Aquara, both had the surname’capozzoli ‘ when the met .my grandad was Antonio and my gran was Elvira.Elvira’s dad (I believe his name was Vincenzo)went to America with a lady called Josephine also from Aquara, he took his eldist daughter Rafelina,there he began a new life and started a new family, with out divorcing his first wife in Aquara.We have only found this out through contacts on Facebook. i have an old photo of some one from Aquara whos name is Luigi and was my dad’s step grandad, so I have been told, but there is such a family resemblance that I dont think the story is true.Do you have any relativesin the UK?